The factors that affect surgical skill development are not fully understood. There has been growing interest in the impact of self-assessment on surgical skill performance. 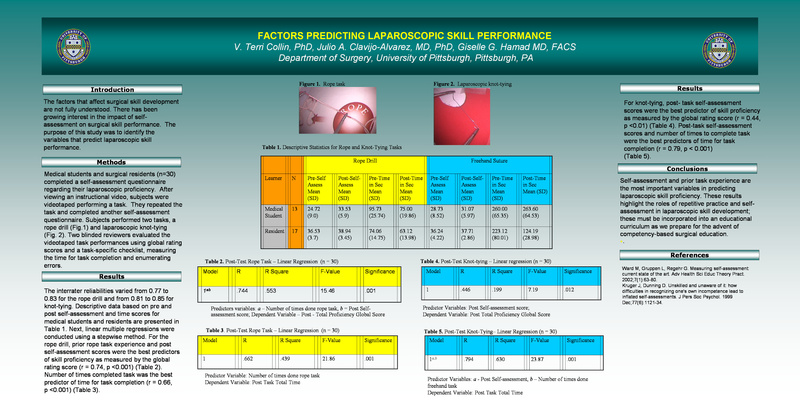 The purpose of this study was to identify the variables that predict laparoscopic skill performance. Medical students and surgical residents (n=29) completed a self-assessment questionnaire regarding their laparoscopic proficiency. After viewing an instructional video, subjects were videotaped performing a task. They repeated the task and completed another self-assessment questionnaire. Subjects performed two tasks, a rope drill and laparoscopic knot-tying. Two blinded reviewers evaluated the videotaped task performances using global rating scores and a task-specific checklist, measuring the time for task completion and enumerating errors.